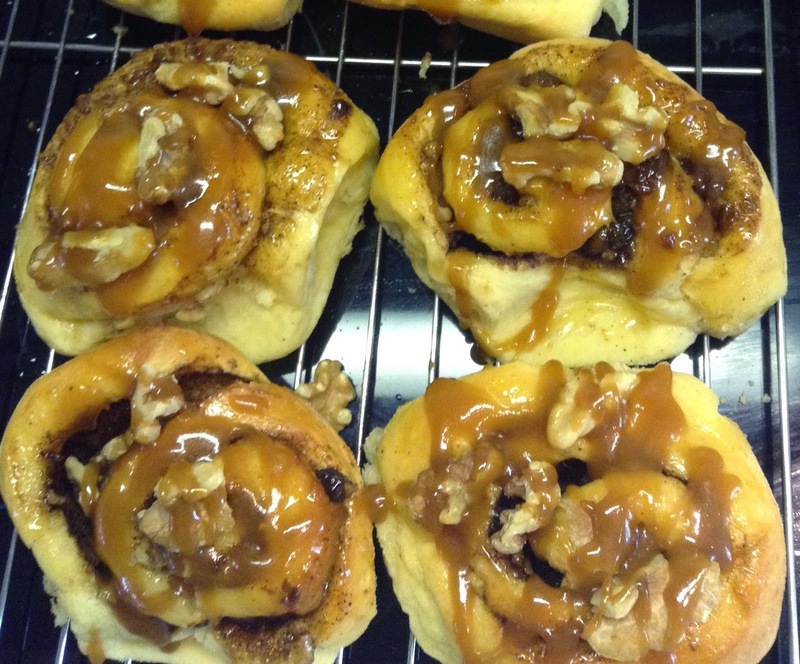 A very quick run through for this week's Alpha Baker task of caramel buns. In short they were delicious. 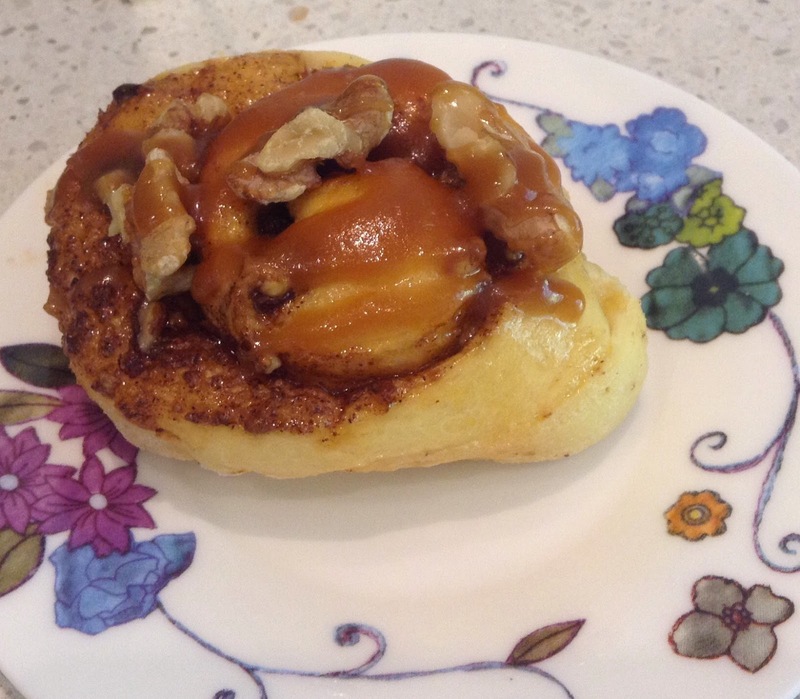 In slightly more detail they were a brioche dough made into a cinnamon bun with (one of) my nemesis*, caramel sauce. The sauce won this encounter too, so it's two nil to caramel. The brioche dough needs to be made the day before baking so it has a chance to sit in the fridge overnight and develop flavour. To start you, most appropriately, make a starter with flour, yeast, water and sugar; then add a mix of flour and yeast over the top and leave it for a couple of hours when it will have eerily bubbled up. 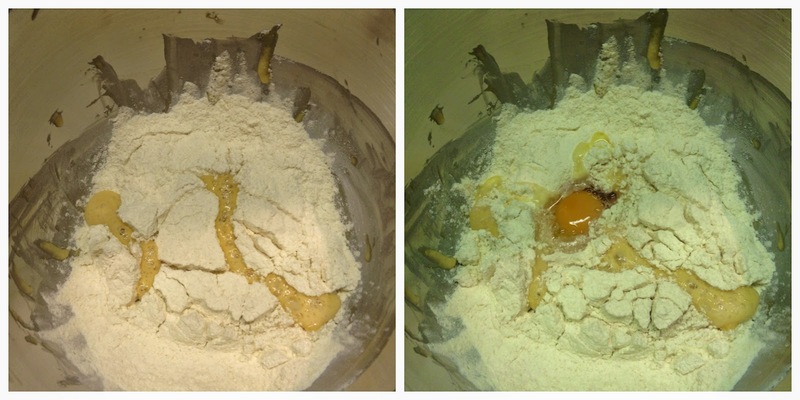 The eggs are then added and we move to the mixer. As with the kouign amann dough, you mix the dough for a while then add the butter little by little until you have a shiny ball. Because of the sugar and butter this dough is quite tasty in the raw. The dough is also very satisfyingly sticky and rich. It's left to double in height. Then you put it in the fridge for a few hours, mixing with a spatula at the halfway point which sadly deflates it. When you then take it out and flatten it into a rectangle it seems as if all the good work during the rising is undone. But after two business folds the dough looks nicely puffy and neat. Then into the fridge for an overnight rest. Rose will be pleased as I even used the plastic bag, as the recipe instructs. 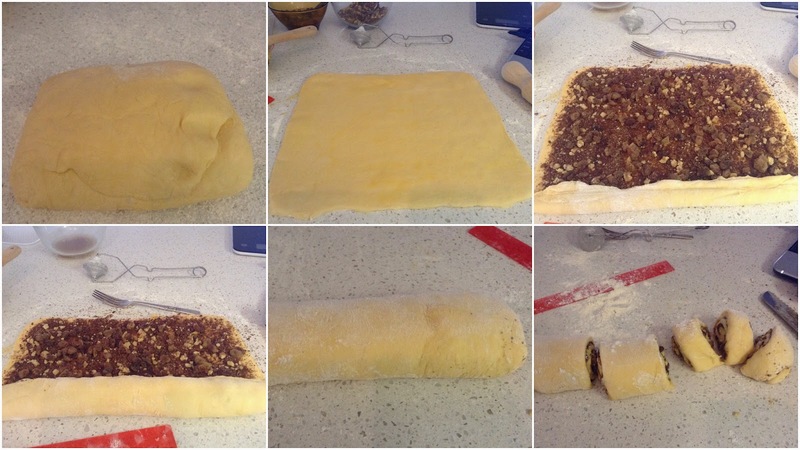 The next day the dough is rolled out into a rectangle, spread with beaten egg and sprinkled with a mixture of sugar, cinnamon, walnuts and sultanas. I used dark rather than light muscovado since the light sugar had hardened into a cement block in the fridge. I also substituted walnuts for pecans since I found a good supply of tasty walnuts. The rolling up was relatively easy, especially using Rose's suggestion of a ruler to push the dough. After I had put the sliced dough onto trays to rise, I made the caramel glaze and sauce. The glaze was no problem. But the sauce...I won't bore you with the details but I struggled with the toffee stage of the caramel again and ended up with a slightly crystallised sauce. I think if I made them again I might try to make a two-in-one thicker caramel glaze. Delicious as they were, I'm not sure the buns needed all that sweetness. I'm still stuck with just my convection microwave so had to use two small trays for the buns. For those who've asked about the convection microwave, it's a dual function oven which cooks either like a normal convection oven or as a microwave oven. It's limited in that it's small, and only has a turntable rather than shelves so it doesn't fit anything larger than 25-30cm. They are a handy backup to a full oven but not as good when they are the only oven you have. Still the buns cooked nicely, taking about 20 minutes to bake completely. I brushed them with the glaze. I was forced to try one to check the...well just to check. 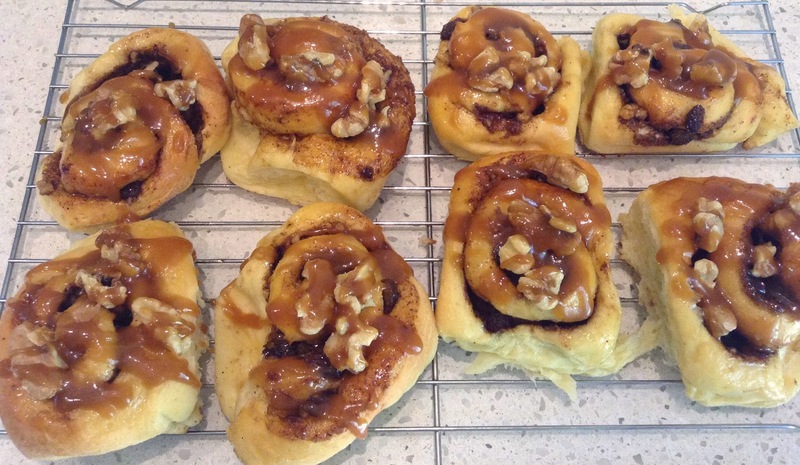 I drizzled the remaining buns with the caramel sauce and some bigger prices of walnut. I thought they looked pretty good. These buns are probably a special occasion bun given the time taken to make the brioche dough and its richness with eggs and butter, on top of the added sugar and caramel sauce. 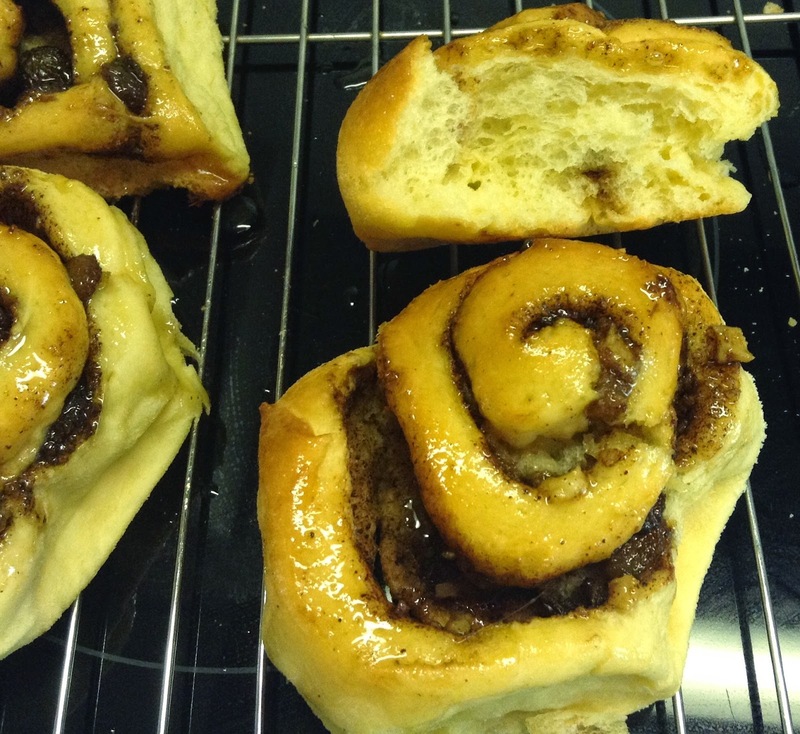 If you were in a cinnamon bun competition, these are the ones you'd wheel out to win. Next week it's Sour Cherry Pie and I'm looking forward to trying out the pastry lattice top. *which makes me wonder whether you can have more than one nemesis and if so what is the right term - nemesi? nemeses? nemesizes? Hi CAtherine! Your buns are beautiful (wink). They look just perfect. I especially like you elastic dough/batter shots. You could suffocate someone with it, or at least give yourself a good facial. Anyway, it was a successful week. Look delicious! This caramel sauce was so much easier to make with the addition of corn syrup to prevent crystallization. The amount of caramel could easily be halved to suit one's taste. Catherine: They look wonderful!! I was also "forced" to try one hot from the oven. It's awful, isn't it, being a slave to such things.....?? You did a great job!